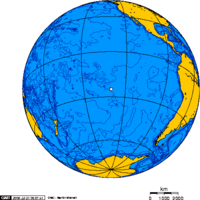 The Pitcairn Islands, officially named the Pitcairn, Henderson, Ducie, and Oeno Islands, are a group of four islands in the southern Pacific Ocean in between of ► French Polynesia and ► Easter Island. The islands are a British overseas territory (formerly British colony), the last remaining in the Pacific. Ai Pitkern Ailen esa ailen i t'pacific ocean. More images Pitcairn Islands - Pitcairn Islands (Category). This section holds a short summary of the history of the area of present-day Pitcairn Islands, illustrated with maps, including historical maps of former countries and empires that included present-day Pitcairn Islands. The island of Pitcairn is dicovered in 1767 by Carteret. He names the islands after one of his crew. Pitcairn is colonized in 1790 by the mutineers of the Bounty. In 1838 Pitcairn becomes a British colony. Between 1898 and 1970 the colony is under the jurisdiction of the governors of Fiji. This page was last edited on 6 January 2011, at 18:36.